Before yesterday I took the kitchen table and chairs out to the garage. 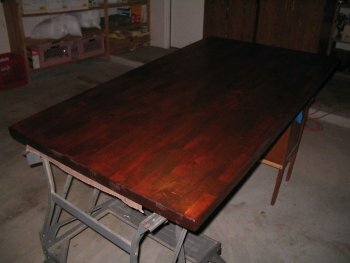 As I have said previously I refinished the table top, which looks pretty good. 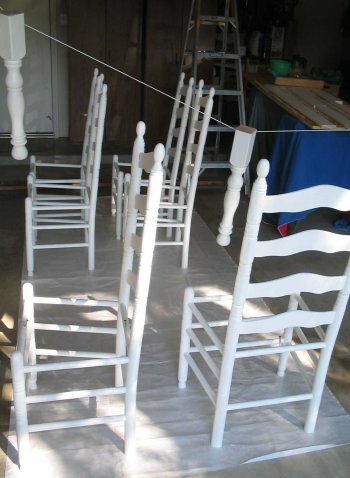 Now it’s time for the chairs and table supports to be painted white. I thought I had some paint, but when I opened up what I had it was either too little or dried out. So off I went to Home Depot to get some bright white enamel. 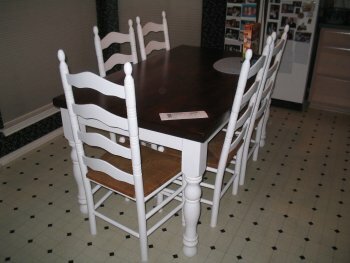 Afterwards I spent about four hours painting six chairs, four legs and all the table parts including the drawer. Now they are drying and I’ll assemble it later tonight. I’ve missed having this table. Typically each morning I sit at this table, eat my breakfast and read the paper. 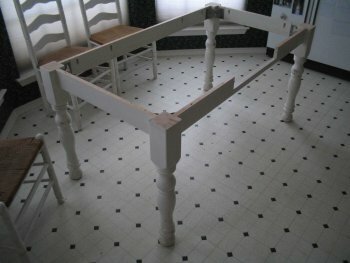 In the meantime I’ve had to use the dining room table, but it’s not the same, nor is it as convenient. Had a mammogram and ultrasound today. I was lucky and someone canceled their appointment so I got it and went in. It was at the Women’s Imaging Center. The results were as follows… The mammogram was inconclusive. The ultrasound showed something and the doctor suggested I get a biopsy. So that’ll be next. IMHO, I think the lump is getting smaller, but we’ll let the doctors decide. Last week as I started on my long run I felt soreness in my right upper chest. Since I’d been doing all this sanding, and staining on the door and table I thought it was just muscle soreness. As the run continued I forgot about it. Later that day I continued on my refinishing chores, but didn’t feel the soreness then. 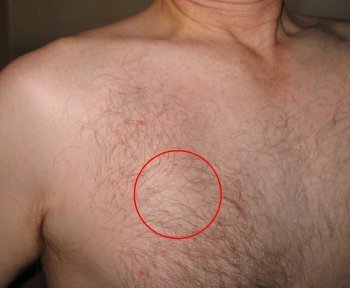 I think it was on Sunday or Monday that I noticed a lump in my upper right breast. It wasn’t especially tender, but it was harder than my normal breast tissue and it was about two inches across. I showed it to Kathy on Monday night who told me to get an appointment with the doctor to check it out. I went in on Wednesday afternoon to see the nurse practitioner who checked me out. She said that it didn’t appear to be an infection (no redness) or the lymph nodes weren’t sore, and suggested I get an ultrasound. So now I’ve got an appointment for a mammogram and ultrasound on November 6th. Naturally I have no idea how long that I’ve had this lump, but now I constantly feel it especially as I jiggle along as I’m running. Naturally I’m worried since I have a propensity for getting tumors of various types – foot, hand, brain, what have you. All week long I’ve noticed how nice the dark stain and the bright brass handles have looked when I walked up to the front door. On Saturday I continued to work on the front door. After my long run, a short nap, and a shower (in that order) I took the door down and brought it into the garage with Katie’s help. 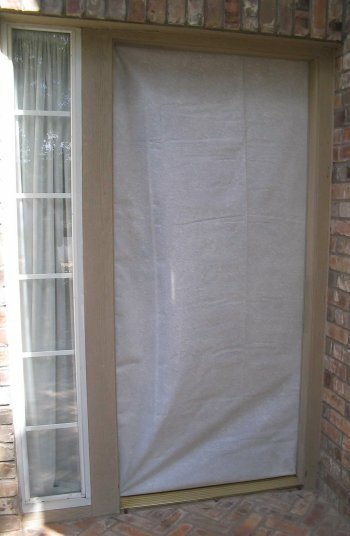 We again sealed up the open doorway similar to last week with a paint drop cloth and wood strips. By that time it was early afternoon. We applied the first coat of polyurethane and let it dry for six hours. Before bed I went out, sanded it, and applied a second coat. That night only a paint drop cloth covered the front door. On Sunday I got up early and applied a third coat to the entire door. 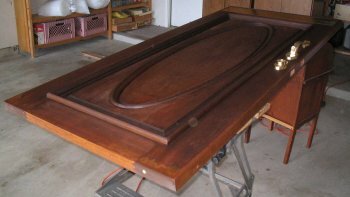 Around noon I applied one more coat to the center panel of the door for added protection. Even before it was dry Katie and I carefully remounted the door. I think it looks even better now. 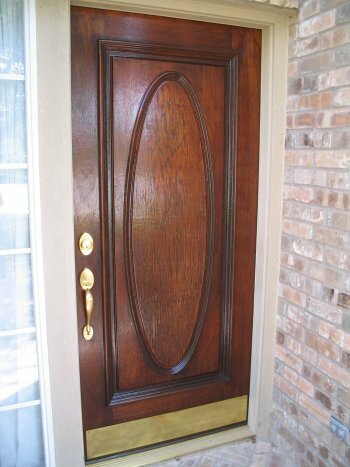 In my humble opinion a nice looking front door, even one with character – meaning it’s not perfect, says something about the people that live there. I look forward to the holidays and our children and their partners arriving at this front door and the festive home inside. But it’s not just what other people think, instead and more importantly it’s what I think when I walk up and see how nice our front door looks and that makes me feel good inside. You are currently browsing the Watt's Up blog archives for October, 2008.